The Harmony of the Seas is pretty big. THE HARMONY OF the Seas, the world’s largest cruise ship, set off yesterday on its first sea trial from Saint-Nazaire, western France, with just two months to go to delivery. The city’s STX France shipyards began building the €1 billion mammoth for US shipbuilder Royal Caribbean International (RCI) in September 2013. The ship, with a height of 70 metres, has been an imposing presence in Saint-Nazaire, visible from miles away. For months, tourists have been allowed on board to gape at the innards of the ship that has 16 decks and stretches 362 metres, 50 metres longer than the height of the Eiffel Tower. Three pilots who have trained on a simulator in nearby Nantes for the past year, helped the captain in the tricky manoeuvres needed to guide the hulking ship out of the Saint-Nazaire estuary. The pilots will leave the vessel once it is 20 kilometres out at sea. 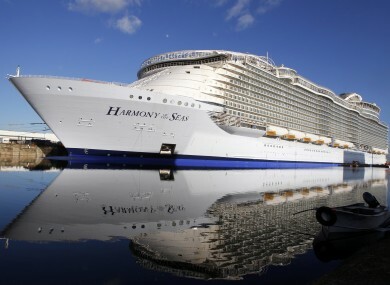 Some 2,000 crew are to cater for the needs of more than 6,000 passengers on Harmony, which is a metre wider than the current twin ocean-going monsters of the pleasure cruise world, the RCI-owned Allure of the Seas and the Oasis of the Seas, which are also 362 metres long. Email “The largest cruise ship in the world has set sail - here's what it looks like ”. Feedback on “The largest cruise ship in the world has set sail - here's what it looks like ”.